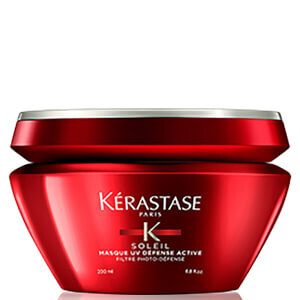 Treat your hair to the nourishing properties of Kérastase Soleil Masque Après Soleil, a deep recovery hair mask that works to replenish hydration after exposure to sun, sand and salt. Enriched with Coconut Water, the intensely moisturising masque has a unique gel texture and lightweight finish that avoids weighing down even the finest of hair. 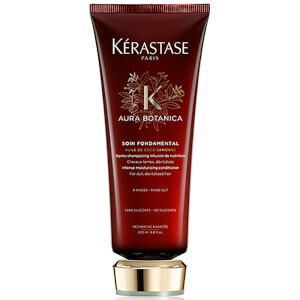 It effectively smoothens the look of hair fibres to promote a uniform touch from root to tip. Infused with a summer-inspired fragrance powered by Jasmine and notes of Solar Tuberose. Apply to washed and towel-dried hair. Massage onto lengths and ends. Leave in for 3-5 minutes. Emulsify and rinse thoroughly. Aqua / Water, Hydroxypropyl Starch Phosphate, Quaternium-87, Stearyl Alcohol, Behentrimonium Chloride, Propylene Glycol, Amodimethicone, Caprylyl Glycol, Phenoxyethanol, Candelilla Cera / Candelilla Wax, Isopropyl Alcohol, Trideceth-5, Glycerin, Ethylhexyl Salicylate, Cocos Nucifera Fruit Juice / Coconut Fruit Juice, Trideceth-10, Chlorhexidine Digluconate, Benzyl Alcohol, 2-Oleamido-1,3-Octadecanediol, Tocopherol, Acetic Acid, Citric Acid, Sodium Benzoate, Potassium Sorbate, Parfum / Fragrance.